I met Brendan Taylor when I joined Tru School Sports as a writer. TSS wasn't just old school or new school, it was true school, covering the world of sports and it was Brendan's brainchild. I really enjoyed writing for TSS. It had a good group of writers and seemed to be heading in the right direction. Unfortunately, somewhere somehow, the plan went awry and TSS was no more. It would be easy to blame Brendan for the demise of TSS. It was his vision that started it and he was in charge. I don't blame Brendan. I thank him. He gave me another national platform to present my writing. Running any site is not easy, especially a site covering topics that need to be addressed on a timely basis. Brendan's idea was great, but it just didn't work out long term. I am happy to report that Brendan is doing well though. He still runs the TSS YouTube channel and is focused on boxing, his real love. Brendan is a talented young man and he should do great things in the future, whether on line or not. Below is Brendan at his happiest. 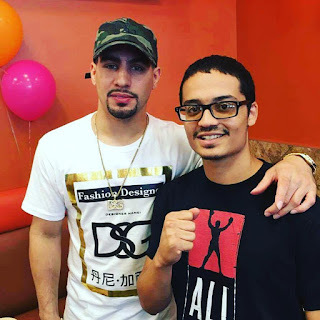 He was meeting Danny Garcia, a former two-weight world champion. This is the Brendan that I knew. He is happy, relaxed and doing what he loves. You can check out Brendan's latest projects at the Tru School Sports channel on YouTube. Danny Garcia and Brendan Taylor in Broward County, Florida-April 2017.